When Christmas time comes we usually think of Mexico. With Sonia’s family in Chihuahua Mexico we usually go there and this year was no exception. So we packed our flannel shirts, long pants and wool caps and a couple days before Christmas Eve flew Seattle to Houston, then Houston to Chihuahua. Flannel shirts? Wool hats? Why would we want those things in Mexico? When most people outside of Mexico think of Christmas in Mexico they think of palm lined beaches along the Caribbean or the Pacific, sipping margaritas on a white sand beach. But Chihuahua is far from any beaches and it isn’t groomed to be a tourist destination. It’s a large industrial city set in the high deserts of north-central Mexico and surrounded by the Sierra Madre Mountains. Winters in Chihuahua are often colder than at our home near Seattle. So, we’d have a real Mexican Christmas; Chihuahua style. Sonia’s nephew Jacobo and his fiance Reneé picked us up at the airport and took us to her sister Sagrario’s house where we’d stay for the next nine days. 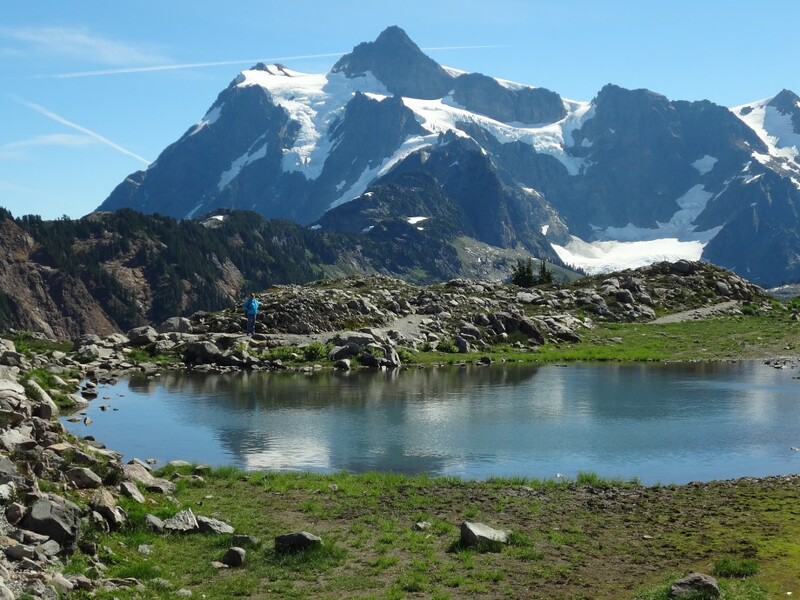 The festivities began as we put our packs in the bedroom with family arriving by the carload and soon the living room was full of sisters, brothers-in-laws, nephews and nieces. We set up a big table in the living room within reach of a large cooler full of hot tamales of three types; shredded meat in red chile sauce, sliced green chiles in a green salsa, and sweet tamales of anise and raisins – I ate two of each before collapsing in a chair with an after dinner shot of mezcal (a tequila-like liquor). We laughed and talked until 2 a.m. pushing my Spanish to the limits, but I was able to keep up. This would be one of the earliest nights we would have – parties last long into the night in Mexico. We woke to a light frost on the ground the next day, but it soon warmed to sixty degrees F. We met some old friends visiting family in Chihuahua from their home in Mexico City for breakfast at our favorite restaurant, La Doña. Felipe is a well-known actor in Mexico now preparing to run as a deputado (Congressman) while his husband Jaime manages their business affairs and watches over their adopted daughter Alejandra. After a nice two-hour lunch we returned to Randy and Sagrario’s house in time to receive more family coming in throughout the day and into the night and doing serious damage to the tamale supply. But next day is Christmas Eve and we’d be cooking all day, so we made an early night of it turning in at the remarkably early hour of 11 p.m.
Christmas Day, cool and clear at sixty degrees. Sonia and I met Sagrario’s son jacobo, his fiancé Reneé and cousin David at the local outdoor barbacoa stand for breakfast (chopped pork tacos). Then back to Sagrario’s house where Sonia set to work on her signature stuffing for the turkey; a sweet meat mixture of ground beef mixed with peaches, apples, almonds and spices. Randy was on turkey detail preparing the eight kilogram turkey while I chopped onions, cut up sweet potatoes, and provided general support to the various chefs. Sagrario and Randy mixed up the basting marinade for the turkey, a family recipe of fresh ginger juice mixed with Coca Cola, and injected the turkey with it. This makes a remarkably juicy turkey and not sweet as you might think. By 9 p.m. all the guests had arrived, a small crowd this year only fifteen in total, and dinner was served. At midnight everyone wished each other a happy Christmas and we talked and danced until 2 a.m.
Unbelievably the following day we ran out of leftover turkey but by afternoon the house was full of family and friends again. So we took up a collection and bought a supply of tacos and salsa sufficient to feed a platoon, along with more beer of course, and talked and danced again until 2 a.m. When we awoke the next day we cleaned up from the night before, no small task. But today the party would be at Sandra’s house, Sonia’s and Sagrario’s sister. It was Luis Angel’s birthday, her youngest son. Her husband Alejandro was making his signature dish, asado con chile colorado (roasted beef in a red chile sauce). This is one of my all-time favorites and Sandra and Alejandro are masters at making it, famous throughout the family. When we arrived in the afternoon at Sandra’s house it was full of family and friends, about thirty people packed into the small living room and soon we were eating heaping plates of chile colorado and toasting each other with shots of sotol (another tequila-like liquor made only in northern Mexico). I borrowed a guitar and Sonia and I sang a couple songs for the crowd, then karaoke machine came out and the singing and dancing got serious and lasted into the wee hours of the morning with everyone, young and old, taking their turn at the karaoke machine. Vacation time was coming to a close, but there were still a few things to do before we left. While Sonia visited some more friends I went to Randy to some hot springs far out in the desert south of the city. These springs boil up out of the desert floor and some small, brick rooms have been built near them where the thermal waters are directed into tubs. The day had warmed up into the low sixties and a few local families were splashing around in a large hot pool outside while Randy and I paid 30 pesos each to soak in one of the tubs and the crumbling bath house for a couple hours. We returned to Chihuahua refreshed and relaxed for a quiet evening of movies and eating leftovers – tamales, tacos, meat turkey stuffing, cake – whatever was left. Next day we decided to get the family together at a favorite fish restaurant outside of Chihuahua, so we met everyone at El Siroco for a fresh fish dinner. While the others selected their fish from a cooler near the kitchen I couldn’t pass up one of my favorites, coktel de pulpo (octopus cocktail). It was fresh and delicious and we had a good time listening to the norteño trio serenading us with accordion and guitars while we ate. Afterwards we went back home to rest up a bit; tonight we were going to our favorite cantina, La Roca (the rock). For us no trip to Chihuahua would be complete with spending a few hours at La Roca, a tavern in central Chihuahua where college-age people like to hang out. We went with Sagrario and a couple of her other sisters and husbands and sipped glasses of beer mixed with a salty chile sauce and ate baked potatoes covered with queso asada (roasted cheese) from the permanent taco stand out front. We sang along with mariachi and rock favorites playing on the jukebox till 11 p.m. and made it an early night going to bed by midnight. But now it’s time to get ready to go. 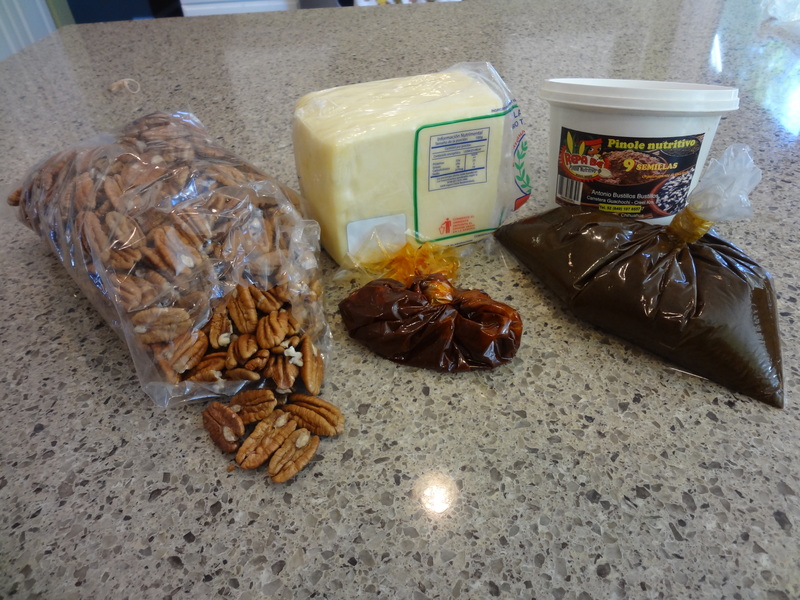 Sonia went to the central mercado in Chihuahua and bought some essentials; mole paste (a base for making mole sauces) and ground pinole (a spiced cornmeal). Later we bought a kilogram of fresh local cheese made by the nearby Mennonite community and appropriately called queso menonita (Mennonite cheese – a mild fresh cheddar). Sonia’s father gave us a large bag of fresh pecans which are grown locally and our supplies for returning home were complete. Once back in Seattle, Sonia will make pavo en mole (turkey in mole sauce) and I’ll bake a pecan pie from the specialties we brought home. Randy, Sagrario’s husband, is the director of Tierra Nativa, a non-profit organization dedicated to ensuring land rights for the Tarahumara Indians that live throughout the state of Chihuahua and he had a day of interviewing scheduled with some Tarahumara leaders in a canyon full of petroglyphs on the edge of the city. I was invited to come along and we loaded up his old Chevy Suburban with a Tarahumara spokesman and a local Tarahumara family, a video producer, and set off for the canyons to film the interviews. But a rear wheel came loose on the Suburban before we got out of town, so we had to return without filming the interviews. They would go again later in the week, but Sonia and I had to leave before that, so I said good-bye to the Tarahumara family and walked back to Randy and Sagrario’s home, disappointed but glad everyone was safe. Time to go. We finished visiting and saying good-bye to family and drove to the airport. As we boarded our plane a Mennonite family in front of us talked gently amongst themselves in their old-world German idiom mixed with Spanish phrases. There’s a large Mennonite community near Chihuahua, but it still seems strange to me to see such blond, blue-eyed, European-looking people here in the deserts of northern Mexico; women in long prairie dresses and bonnets and men in their strikingly clean coveralls and fine straw cowboy hats. But it was a great reminder of how diverse Chihuahua is; Mennonite farmers, Tarahumara Indians in their colorful dresses, vaqueros (cowboys) in their smart Stetson hats and fancy cowboy boots, businessmen hurrying along with their briefcases and an isolated American tourist here and there visiting friends and family. Time to go, but we’ll be back – sooner rather than later I hope.